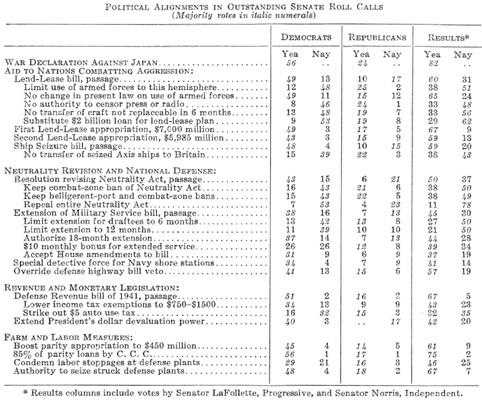 Leading roll calls in the Senate during the 1941 session are given in full, by geographic areas, in the table shown on the following pages. Political alignments in these and other important Senate roll calls are shown below. In drawing conslussions from the above table, it must be remembered that all except one of the roll calls analyzed were taken before the United States became an active participant in the war. On the resolutions declaring war the vote was unanimous. All previous roll calls on important questions of foreign policy had shown majorities of the Republicans and Democrats aligned on opposite sides. The administration's revision of the Neutrality Act commanded only six Republican votes in the Senate, the 18-month draft extension only seven Republican votes, and the Lend-Lease Act only ten Republican votes. After the Lend-Lease policy had been adopted, appropriations to carry it out received majority support from both parties.